When it comes to writing, hexagon takes another form. It is a prewriting technique. This is specifically used in literature. It is useful as allows allotting different aspects and focus on different sides of the hexagon. Each of this level relates to a different level of Blooms taxonomy. This technique can also be used to narrow a topic which is not an angle from which to look at a piece of literature. 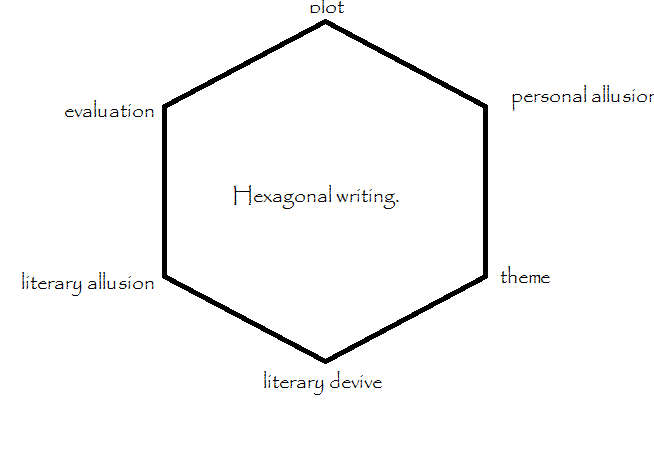 Hexagonal writing is a great way analyse literature, but also to look at ideas when brain storming. Comprehension – the personal allusions, what the story remind you of, how does it relate to your life can you draw a parallel? Application – in simple words the theme—what is the author trying to say? Try to sum up in one word and then stretch it to a sentence. The idea should be a big one and it should be able to stand on its own. Each story can be told from different point of view. Pick up sentences that support this idea. Analysis what are the literary devices used, images similes, metaphors the language the choice words the author uses to create the ambience. Synthesis or literary allusions – what other texts, books or poems does the story remind you off? Finally judgement I prefer to call it evaluation, what do I like and what do I dislike, do I like the work or do not like it? why and why not? Simile – comparison of two things using like or as. Metaphor – comparison of two things without using like or as. Personification – giving human qualities to an animal, object or idea. Flashback – an interruption of a sequence of a narration that happened at an earlier point in time. Next PostNext Ah journey through hope. Heavens above! How smashing!